Craft a new mandala every week for one year with this full-color guide—52 bright and cheerful designs in all! The easy-to-follow instructions will show you how to transform ordinary stones into inspirational works of art. The mandala, derived from the Sanskrit word for "circle," represents the universe. With author F. Sehnaz Bac’s teaching, you’ll see how to sketch guidelines, paint and then use pens to make your own little universes! 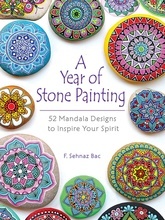 This treasury of radiant designs presents patterns for stone paintings, each of which is accompanied by a one-word mantra—relax, tranquil, spirit, dream, believe, and other uplifting terms. Colorful photographs accompany simple instructions for a year of crafting inspiration.